Over the last 15 years in Tennessee we have lived in 4 different homes and that means we have had 4 different size gardens. We had a huge garden in our first home, a medium size garden then a much smaller one…our current garden is the smallest and it produces as much as we need plus more. Three summers ago, when we moved in, we had someone build us a raised bed. Our big mistake is that it is only three rows high. If we had gone two more rows higher there would have been a lot less being over. When you are our ages bending over for long periods of time is a killer! 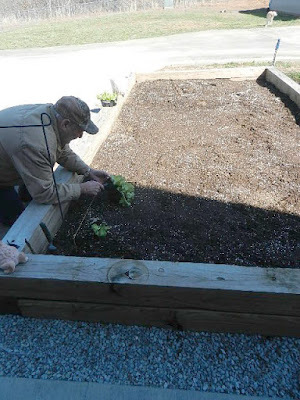 This raised bed garden is filled with mushroom mulch which came from a mushroom farm in Loudon County, TN. We call it miracle dirt! You can buy it by the bag at garden centers or at Lowe’s if you aren’t near a mushroom farm. We don’t really know the chemical compounds of mushroom mulch, but we do know that we get enough veggies out of our little 8 x 16 raised bed for us and the neighbors. The lettuce crop that we harvest is amazing and things grow fast! We have no need to add any enhancers or feed the plants. Do we still get weeds? Yes, unfortunately we do, that’s a given. However, since the mushroom mulch is very soft it’s quite easy to get the weeds out. You treat it just like any veggie garden, but you get better results. If you are thinking about a garden and wonder if a raised bed is ‘good enough’, it is. You can make it yourself, have one made or you can even buy raised beds online but they are expensive. Raised Bed last July, it is loaded with good stuff! My husband planted lettuce before we had two frosts, he covered the plants, and we did manage to save a few and they are producing, we already had a fresh garden salad a few days ago. The lettuce crop will go on for most of the summer. We have carrots and Swiss chard and sweet potato planted so far. We will be putting in a few tomato plants very shortly. You can plant most any veggie, but remember corn wouldn’t do well unless your raised bed was very large! First Garden Salad of the Season! If you aren’t into growing your own salad but would prefer a flower garden, it would work for that too. You can put one wherever you want and make it whatever size you need. We have 8 acres but our little raised bed is perfect for us and it might be perfect for you too. Here is a link with information to get you started and one more.